I read Bill's book, THE COLORADO SPECIAL, about a murder among a trainload of actors on a theater tour of Colorado. I don't remember any details but I know I enjoyed it. I'll have to look for yours. Happy birthday, James, you young whippersnapper. Thanks for reminding me of the Faraday series. I don't remember much about THE COLORADO SPECIAL, but I do remember that it was fun to write it. Jeff remembers more about it than I do! Bill, weren't there rumors at BCI that your second Faraday novel, THE AVALANCHE EXPRESS, was printed by Lynx but never distributed because the company collapsed while the book was still in the warehouses? That would be a real find, to come across a copy of that one. When I read the title I thought it was a tie-in with the television show Iron Horse with Dale Robertson. It sounds like a fun read. I'll check the few used book stores left for a copy. Thanks for all those years of filling the world with your stories. I hope you have a good Birthday and many more. 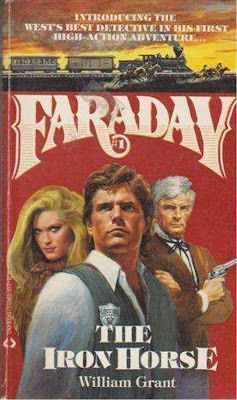 I'm pretty sure there was a tie-in novel based on the Dale Robertson TV series, which I remember watching when it was new. I think the book was by William Johnston, who did so many tie-in novels back in the Sixties and Seventies. What usually happened to a book that wasn't published when a company went under? Did you shelve it or rewrite it for a different series? Very cool. So what happens to a book written for such a company that is unpublished because of some glitch? Does it get repurposed for another line? Happy birthday. This sounds like it would have been a fun series. I've never had that happen with a novel of mine, but if it did I'd probably try to turn it into something else. I sold a novella to an anthology that never came out, and if I still had a copy I'd publish it myself (it would work as a stand-alone), but that's one of the manuscripts that was lost in the fire back in '08. On several occasions I've written an outline for a book in one series only to wind up using it for a book in another series. I think if Bill still had his Faraday book, he could publish it himself. John Ford would have liked the title. Happy B-day! I'll suggest that cover makes the Old Man look a bit more like Sam Elliott than Ted Knight, but it's a pity Lynx fell apart so abruptly...I recall theirs were a more professional-looking set of releases than, say, Paperjacks. Paperjacks was a pretty low-budget outfit, all right, but they published some good books while they were around. I liked the Westerns Bob Randisi wrote for them. Happy birthday (or celebration of the date of your birth) or whatever. Have a good time. Happy Birthday, Mr. Reasoner! I like the old-fashioned cover of the book; the kind I'd like to read. Happy birthday, James! Your book and Bill's were the only two I read in that series. I enjoyed them both. Happy Birthday! I don't think Lynx Books ever showed up in Western NY. I've never seen a copy. But this series sounds like fun! And Paperjacks had more Pronzini novels in print at one time than any other bound-pages publisher, I think...but a real pity, the quality of the layout and all the cost-cutting. James, that was the rumor, all right. I can't remember who started it. One of the editors at BCI wanted me to rewrite the book as a YA novel, and I did three chapters of it. I never heard anything else from them about it, however. "The business was a lot different in those days, but it was fun, too." Amen, brother. Happy Birthday! As a very small birthday gift from me to you, I make you a promise: I will find a copy of your book to read! BTW, Crimes in the Library has been reactivated, and I invite you -- and you legions of followers -- to visit and comment every now and then.